Tim Burton is on a role lately....and God bless him for it. After recently debuting the trailer for his gothic kids flick Frankenweenie, his royal darkness unleashes the deliciously dark trailer for his upcoming horror tale Dark Shadows. 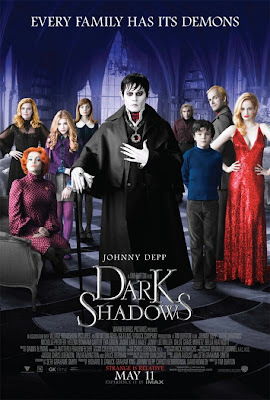 Based on the 1966–1971 soap opera, the film, which reunites Burton's usual suspects Johnny Depp and Helena Bonham Carter, chronicles the quirky lives and stories of the wicked Collins family. Depp stars as Barnabas Collins, who's turned into a vampire and laid to rest before his time by the woman he jilted, Angelique Bouchard (Eva Green). Freed from the coffin he's buried in over a century later, he tries to return to the old Collins manor only to find it's now in ruins and his descendants have wreaked havoc to it over the years. Judging by the trailer alone, this looks right up Depp and Burton's alley with an obscene amount a quirkiness and goth mixed with comedy and intrigue. Michelle Pfeiffer returns to the big screen (after her role in the disastrous New Years Eve last year), with what looks like a character she can really sink her teeth into (pun intended) as Barnabas' cousin, Elizabeth. I've been waiting for Pfieffer to get back to playing juicy parts like her roles in Batman and What Lies Beneath, so I'm especially excited to see her in this. Jackie Earle Early and Carter round out the cast as the Collins manor caretaker Willie and Elizabeth's shrink Dr. Hoffman, respectively, and Chloë Moretz stars as Elizabeth's spitfire daughter, Carolyn. I'd be lying if I said I didn't laugh at this trailer. I can't wait for it. May 11th can't come fast enough. I really hope this movie will be a success because Eva Green certainly deserves one, at last. She is such an amazing actress and her bad luck with chosing movies should finally end, enough is enough. The trailer is so much fun, love the soundtrack already. At first I had no interest in this movie because I remember not being interested in the 70's show! But this trailer got me hooked! And I love Eva Green too and she looks so good. Thanks for posting Candice! I am torn on this one. There were parts of the trailer that made me laugh. However I could not shake the notion that the trailer plays like a mash-up between Edward Scissorhands and Death Becomes Her. The casting is what really peaked my interest though. At first, I didn't know what to think of the trailer. Now I can honestly say that I'm not excited about this film. But the cast is cool and I usually dig Burton movies. The styling is very good though.